When it comes to IPAs, California is so spoiled with great breweries that we almost had to give the state its own bracket. Fourteen of the 16 beers here are from the Golden State, and several of them are among the most celebrated makers of India Pale Ale, with many of the beer’s ingredients, including the West Coast hops, sourced locally. It was a given that some highly respected California IPAs were going to exit in the first round, but the winners of this region were undoubtedly some of the best we tasted. If there was any question to California’s reputation for hoppy beer, this round of competition put that to rest. 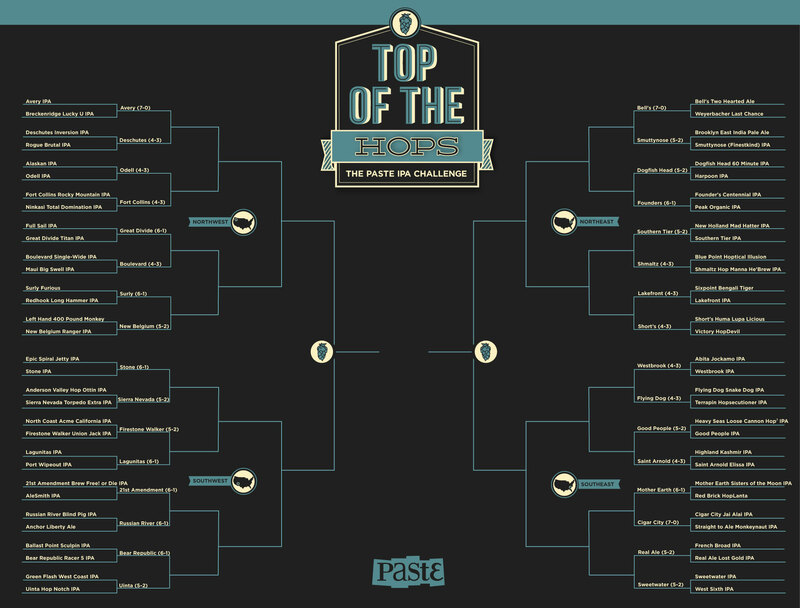 You can see all our Top of the Hops: Paste’s IPA Challenge here. Stone’s IPA is beloved for a reason. With robust hops and subtle spices, it’s still smooth all the way through. Epic’s Spiral Jetty was very light and refreshing but tasted more like an amber ale in comparison to the boldness of Stone. Both these beers had strong hop profile. The Hop Ottin IPA also had a pleasant spicy kick, but Sierra’s Torpedo Extra was lighter and cleaner, leaving more room for the hops. It was enough for the venerable brewery to make it to Round 2. Union Jack is a hop head’s dream. A classic IPA with a full-on assault of pleasant bitterness, it had a few of our judges writing poetry. The Acme was much more unusual with subtle grapefruit notes, but it wasn’t enough to unseat one of the tournament favorites. Two respected beers made for another tough first-round matchup. Port Brewing’s Wipeout IPA has a 99 rating on RateBeer, but its combination of light and bitter was no match for Lagunitas in a blind tasting. The Petaluma brewery had a unique, rich smokiness that won over the judges, who would have been happy to keep drinking either beer. AleSmith’s IPA (known as Irie Pirate Ale before a lawsuit forced a name change) is delicious, particularly if you like floral, piney hops. But 21st Amendment pulled off what many will consider an upset with crisper, citrus-y hops. Anchor Liberty is where the hop revival began. Brewed in 1975 in honor of Paul Revere’s ride, this citrus-y ale was the first major American IPA in production. It has nothing to prove in a competition like this, which is fortunate, since it was paired with Blind Pig. Russian River might not have invented the American IPA, but has damned near perfected it. The hop profile is solid from start to finish, giving it a smooth, classic flavor. Two beers that have notched perfect ratings at RateBeer and gathered plenty of silverware at fests had a first-round matchup that could have been a final. Both offered flavor galore, but Bear Republic’s more appealing nose, smooth start and finishing kick put it over the top for me. Notch an upset for Utah. Green Flash was undoubtedly the hoppier beer, but Uinta’s malt balance, citrus nose and complex flavor was a nice contrast to Green Flash’s aggressive bitterness. Another giant falls in the first round. This round’s judges were Nick Purdy, Josh Jackson, Bonnie Stiernberg, Dacey Orr, Sean Doyle, Tyler Bowden and Randall Smith, who created the red wooden VS. sign. Check back tomorrow to see who makes it to the Sweet 16.